Last Sunday, General Rumen Radev, an independent candidate, won the first round of the presidential elections in Bulgaria. According to the Central Election Commission, the 53-year-old former commander-in-chief of the Bulgarian Air Force, a pro-Russian oppositionist, nominated by an action group affiliated to Bulgarian Socialist Party, gained 25.7 percent of the votes. His rival Tsetska Tsacheva, chairwoman of the Bulgarian parliament and a lawyer from the Citizens for European Development of Bulgaria party (GERB), is trailing with 22 percent, the election commission’s website reports. The winner will be determined in the runoff on November 13. “Bulgarians want more security and effective institutions,” Radev said to his followers after preliminary results of the vote count were announced. Incidentally, once the general launched his election campaign, he demanded that sanctions against Russia be lifted, which made the pro-Western electorate feel uneasy. An ace pilot, who used to fly a MIG-29, entered the presidential race very recently – past month – and immediately emphasized that his country had made a strategic mistake by joining NATO and distancing itself from Russia. The leader of a Bulgarian left-wing party has already called him “puppet” of the pro-Russian military lobby. The media point out that the rest of the candidates also admit that relations with Russia should be warmer, at least during the election campaign. Even Tsacheva said the other day: “Economic sanctions against Russia must be revised. And Bulgarian diplomacy must be more active in the formation of a common European attitude to this question,” TASS quotes her as saying. She added that if sanctions were not lifted, Bulgaria should insist on compensating losses – perhaps she meant, among other things, the failure of the South Stream project. In his turn, Radev pointed out that Bulgaria has no alternative but to be an EU and NATO member. “It does not mean that we must create enemies outside this framework of cooperation. Europhilia does not mean Russophobia. But now the fact is that we are sustaining economic losses,” he said. 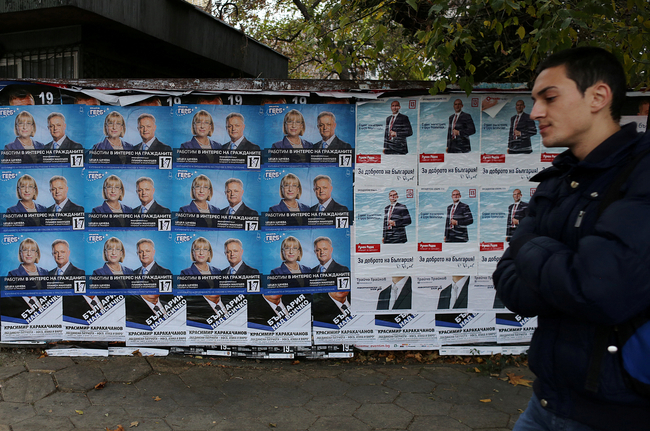 Besides, a three-question referendum was held in Bulgaria alongside the presidential elections. Voters were asked whether they supported limiting generous public funding of political parties, introducing compulsory voting in elections, and replacing the current proportional representation electoral system with the first-past-the-post one. These elections are also particular in that it is the first time the vice president is being elected alongside the president. It will be recalled that, although Bulgaria is a parliamentary republic, the president also wields considerable power. S/he is the commander-in-chief of the armed forces, can veto laws passed by parliament, signs international agreements, and appoints heads of defense and law-enforcement ministries. Observers note that Bulgaria was “Russia’s most dutiful client state” in the Soviet era, and only the current President Rosen Plevneliev changed the country’s course. He condemned the annexation of Crimea and the hybrid war. In a BBC interview past Friday, Plevneliev accused Russia of funding “populist parties and movements,” spreading “extensive propaganda,” and cyber-attacking. For example, Bulgaria “was heavily attacked during the referendum and the local elections” and the attack “was linked to Russia,” the president claimed. “If the ruling party’s candidate Tsacheva is elected president, she will more or less continue the now dominating moderate Euro-Atlantic course. “If Radev wins, there will be changes, warmer relations with Moscow, and instability in Bulgaria’s attitude to the main geopolitical divisions of today between Europe and Russia, between the West and Russia. Radev also expresses interests of the pro-Russian military lobby. This is why he is more closely linked to Russian interests. Besides, he is a candidate from the Socialist Party, the largest pro-Russian party in Bulgaria. We can expect a lot of changes in this direction, which will not strengthen Bulgaria’s position in Europe and the Euro-Atlantic space. “Why is there such a strong Russian influence in Bulgaria? It’s a long conversation, but, briefly, Bulgaria has always been a two-faced country. One face looks West – it is a liberal pro-Western person. The other face is pro-Moscow, pro-Russian, and conservative. Bulgaria has always been looking into these two directions. I must also say that the hybrid war the Putin regime in Russia is waging against all of Eastern Europe in order to destabilize it as part of the European Union is also having an impact on the political situation in Bulgaria.